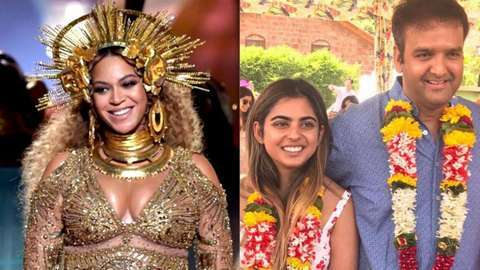 Pop Star Beyonce will come to India, Isha Ambani's wedding to perform at the wedding. Bollywood celebrities including Shahrukh Khan, Priyanka Chopra, Karan Johar and many celebrities will be able to attend this wedding. Mukesh Ambani's daughter Isha Ambani, who is the richest and Reliance Industries chairman, is married to Anand Piramal on December 10 in Udaipur. International Pop Star Beyoncé is coming to perform this grand wedding ceremony. Our website GSM has quoted Filmfare as saying that Isha Ambani is a big fan of Singer Beyonce, due to which Mukesh Ambani is calling for his performance on this special occasion. Isha Ambani and Anand Piramal are very excited about this. Let me tell you that the relationship between Isha Ambani, son of Piramal Group owner Ajay Piramal, has been decided the engagement of both of them was organized last month in Lake Como, Italy. The actresses had come to participate in the actress Priyanka Chopra, Sonam Kapoor, Shahrukh Khan, Karan Johar and many celebrities, now Bollywood actors and actresses will be seen in this function too. This year Mukesh Ambani chose Anand Piramal for the marriage of his daughter Isha Ambani. Isha and Anand have long been friends, both families know each other for four decades. There was also a celebration in the presence of both the families in a private ceremony in May. Isha's twin brother Akash Ambani's engagement came from Shloka Mehta. Following this engagement, Ambani Parivar also announced the marriage of daughter. Explain that Anand Piramal, the son-in-law of Mukesh Ambani, is the son of corporate giant Ajay Piramal and Swati Piramal. 33-year-old Anand is a graduate in Economics from the University of Pennsylvania. He is currently the Executive Director of Piramal Enterprises. Isha Ambani's net worth is $ 100 million, or about Rs 668 crore. When Isha was 16 years old, her name was included on the second spot in the list of Forbes' top 10 millionaire successors.